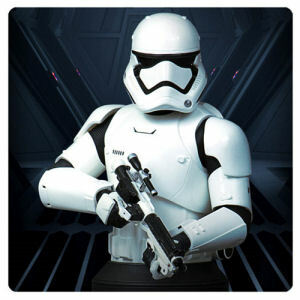 We have Just Sold out of Star Wars The Force Awakens The First Order Stormtrooper Mini Bust. Not to Worry! Fill in the Notify me When Available and you will be the first in line for our restock of Star Wars The Force Awakens The First Order Stormtrooper Mini Bust !! From the Star Wars collection by Gentle Giant. Star Wars The Force Awakens The First Order Stormtrooper Mini Bust. Created using top-of-the-line 3-D technology. Hand-cast and hand-painted this hand-numbered limited edition is limited to 3700 pieces worldwide.